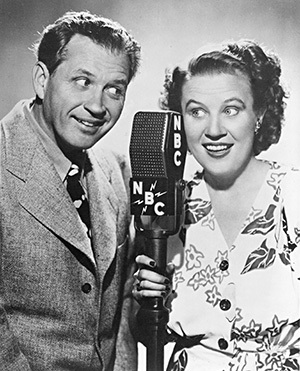 To celebrate Valentine’s Day we’re highlighting one of Radio’s most beloved couples, Fibber McGee and Molly. James “Jim” Jordan (Fibber) and Marian Driscoll (Molly) first met at church choir practice in Peoria Illinois. They started out not in radio, but as a vaudeville act in Chicago. It wasn’t until 1924 (after Jim made a bet with his brother) that they made their radio debut. Their performance was a success and they started working for WIBO making $10 a week. In April of 1935 Fibber McGee and Molly premiered on NBC and ran until 1959. The show became a huge success after three seasons and was influential to radio and comedy as a whole. The show was one of the first to feature recurring characters (most notably Throckmorton P. Gildersleeve) and blueprinted what we know today as “sitcoms”. After radio the show moved to television where it only lasted two seasons. Fibber and Molly did appear in four movies as well. Tune into Fibber McGee and Molly on Theater of the Mind Wednesdays at 11:00am.